“I don’t want to set the world on fire,” the Ink Spots croon, but the truth is, I’ve just arrived outside Galaxy News Radio headquarters with every intention of detonating a nuclear warhead. When the Super Mutant Behemoth charges through the wreckage, bellowing, I’m ready. I take aim, then pull the trigger, letting loose nuclear armageddon. I set the world on fire, and it feels good. When Bethesda’s Fallout 4 was announced to the tune of The Five Stars’ “Atom Bomb Baby,” I, like most people I knew, couldn’t wait to return to the Fallout universe. I decided to leap into Fallout 3. Then I paused. Bethesda-published games like Rage and Dishonored had better combat, and Dishonored had better stealth too. Fallout: New Vegas had launched with a number of improvements, and boasted more quests and flexibility than Fallout 3. So what is it about Fallout 3 that is so special? What makes it such a great game? A video game’s gameplay can be thought of like a language. To properly enjoy a game, players need to be fluent in its gameplay. As a result, every game has to take the time to teach players how to play, which is great, except that it’s often the single most boring part of any video game. This is especially true for Fallout 3. Starting up a new game for this article, I dreaded the prospect of having to go through the training sequence all over again. The best training levels are short; Fallout 3’s is thirty minutes long. First, you’re born, which should tell you just how long this intro is going to be. Your mom dies in childbirth. You pick your name and appearance. Great job! You are now a citizen of Vault 101, a hidden refuge deep beneath the surface of Washington, D.C. It is the year 2258, two centuries after the nuclear holocaust that destroyed the world. Fast-forward a year and now you’re a baby who’s just figured how to walk. Your dad talks to you about your mom’s favorite scripture. Fallout 3 teaches you how to interact with objects. Fast-forward some more, and you’re celebrating your 10th birthday by learning about dialog menus and VATS. After that, you’re 16, and you take a test that helps you set up your skills. The exam takes far too long to be anything remotely approaching enjoyable. Then you timeskip again, and finally, in 2077, when you’re 19, your father leaves the vault for the wasteland outside. By this point, the dull tedium of the game’s intro is at its apex. You, the player, are primed to escape, which is precisely what you do, because Vault 101’s authorities are looking for you. What happens next is one of the best single moments in video game history. It’s so simple. You emerge from the vault after a lengthy, boring training sequence into the whirling wind and blinding sunlight. Plenty of games have visually dramatic opening sequences, but the best developers understand that motivation is everything, and Bethesda has mastered this. By making the Vault 101 so tedious, Bethesda ensures that players can’t wait to get out into the world and explore, which is what the game is all about. Fallout 3 could be quick, but instead it’s slow, taking you through a life, so you really feel like a kid aching to leave the Vault and find the world beyond. It’s great because it’s boring. Plus, players have learned enough of the game’s language to survive. They know how to play the game. Some enterprising players have created “alternate start” mods to the game, and I get the appeal of a shorter intro, especially for experienced players, but even how, after hundreds of hours in the game, I still love how my frustration with the vault mirror’s my characters, and how that thrusts me out into the unforgiving wasteland. It can be hard to write about open-world games, because players can do just about anything in them. They’re often loose agglomerations of mechanics set in gigantic, open spaces with very little sense of detail. They’re not so much worlds to participate in as worlds to be traveled through. It’s why a lot of open-world games have a mission structure that involves lots of travel time, a brief arena fight, and then a conclusion of some sort, usually a cutscene. Batman: Arkham Knight and The Witcher 3, both great games in their own right, exemplify this Point A to Point B approach to level design. Arkham Knight wants you to feel like Batman, so you’re given opportunities to traverse the city like Batman would. Sure, you may find yourself stopping off for an “event,” but Gotham feels like a playground with the occasional distraction. The Witcher 3 wants to sell this idea of epic adventure, so it works hard to make you feel like you’re traveling vast distances and doing incredible things in the process. Not so for Fallout 3. What makes Fallout 3 cool is how its distractions are very curiosity-driven. With Arkham Knight, when you hear a fire alarm, you know you’re going to take on one of the repetitive Firefly events. When you see the bright flashing light of a bomb, you know you’re going to hack it. These events are all more or less the same—you do them because they are tasks you know. Fallout 3 draws you through its world by encouraging you to ask questions: what is that? Where does it lead? What does it do? These are not predictable, repeated events. 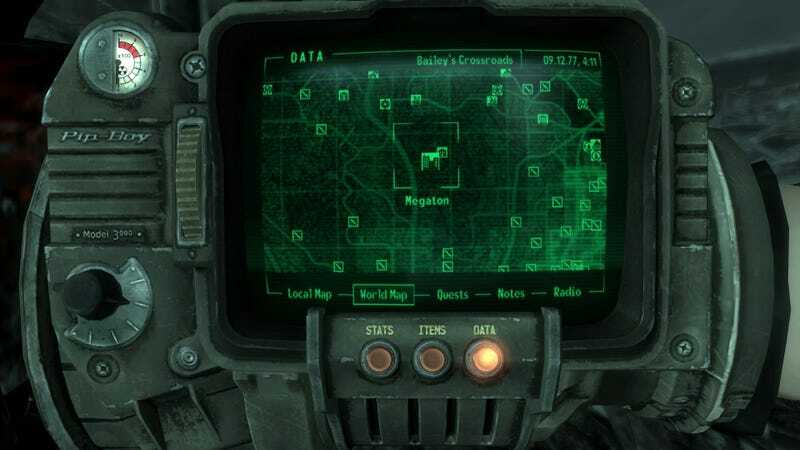 From the vault’s exit, it’s obvious where to go—the town of Megaton shows up on your map marker, but Bethesda does something else that’s super cool: the map immediately guides you away from it. Megaton is ahead and slightly to the right of the player. Given the chance, most human beings starting from a vantage point will head downhill, and the map is set up so that to go downhill, players take a left, away from Megaton. The road winds back around, of course, to a T-junction amidst burned-out homes. You can choose to take a right to Megaton or a left, off into the unknown. Getting to the first settlement in a Bethesda game is always about following the path of least resistance. Another important detail: while most of Fallout’s world is chock-full of distractions, the area around Megaton isn’t. Pull up your Pip-Boy and look at it: fresh out of the Vault, Megaton is the biggest, most interesting place to visit, mostly because the area around it is empty. Experienced players can go whichever way they choose, but newer players will be drawn to Megaton. Megaton is an interesting location, one of plenty in a game loaded with places that have their own personality and flavor. Megaton is a city built inside a bomb crater with a live bomb at its heart. Choosing to defuse or detonate the bomb is a fun quest, and it’s worth accepting, in part because the reward is a house, either in Megaton itself or Tenpenny Tower. I tend not to blow up Megaton because I find its location better than Tenpenny Tower. But when I go to Megaton, it’s for another reason entirely: Moira Brown, one of the main quest givers in the game. Most new players will invariably find themselves in her shop, browsing her wares. Moira’s been a target of derision by plenty of Fallout fans, and I’ve never understood why. She’s a bit quirky, always cooking up wild ideas and occasionally upsetting the locals with her experiments, but she’s friendly. Sshe’s the best mechanic you can find at lower levels. She’s got one of the best places to sell loot. Her quests occasionally unlock some great perks. Most importantly of all, the Wasteland Survival Guide sidequests is a fantastic way to get an introduction to the world. The Wasteland Survival Guide acts like a secondary tutorial for more advanced things. You won’t get radiation poisoning in Vault 101, for instance, but if you work for Moira, you’ll learn how to deal with it. Even better, her quests take you out into the world. Remember how I said that the area right around Megaton is mostly empty? If too many distractions were placed in Megaton’s immediate vicinity, new players might be drawn to them and forget to visit. By keeping the area around Vault 101 and Megaton fairly clear, then utilizing the Wasteland Survival Guide quests, Bethesda does a great job of easing new players into the world before simply dropping distractions on them right away. Moira’s quests take you far from Megaton, and that’s when the game really starts to offer its distractions. For instance, when going to the Super Duper Mart to pick up medicine and food, not only do you encounter raiders and have your first serious battles with other human opponents. Bethesda tosses in some giant mole rats and bloatflies along the way just to prepare you for combat, then has a quick, two-person battle outside the Super Duper Mart for you to tackle before going inside. It’s a great way to dip your toes into the game’s combat without simply being thrown into the deep end. Of course, on my way over, I couldn’t help but be distracted by the rest of the Wasteland. 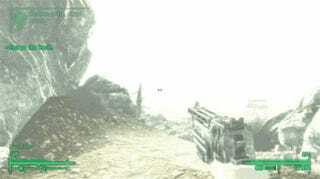 Hidden behind Megaton, for instance, is a hollowed-out rock with a sniper rifle, some ammunition, and a note. There are buildings to explore and traders to talk to as well. Right away, Fallout 3 begins offering distractions. It gets even better when you’re sent to, say, sneak into a monster nest or explore the city of Minefield. Not only are you learning even more ways to play the game, you’re taking these lengthy journeys with plenty of opportunity for distraction. This same quest design extends to the rest of the campaign. One mission sees you going to Rivet City, in the far Southeast of the world map. Another takes you to Raven Rock, in the far northwest. Vault 112 is located to the West. Vault 87 is located further north. The Galaxy News Radio questline takes you to The Mall, which has plenty of potential locations and quests to discover. Even visiting Megaton means traveling northwest to Arefu or south to Tenpenny Tower. There’s always something to find or do, and the quest design is deliberately structured to ensure you have plenty of things to discover as you travel. When you set out to do one thing, Bethesda comes along and distracts you with something else. It pulls you off the direct path. On my way to the monster nest for Moira, for instance, I found a sewer grate that led me into a basement that took me into a comic book publisher called Hubris Comics that led me to a fight with a guy who had a minigun, as well as a ton of loot. Not only that, but when I left Hubris Comics through the front door, I wound up in an entirely new section of the world that demanded my attention. I forgot about the monster nest for a few hours. This is the bedrock of all Bethesda games: go out into the world, get distracted, find more things to do. But there’s more to its world design than that. Fallout 3, like all Bethesda worlds, is much more focused on the second-to-second movement. You’ve got to go up this incline and around that tree and so on and so forth. You’re exploring its world as if it’s there, and there’s always some reason to pay attention to what’s going on around you. There is no Batmobile to summon, no Roach to zip through forests, and certainly no ziplines to send you zooming through the sky. Even New Vegas, the sequel, while improved many ways, from storytelling to mechanics, fails in this regard. Its world is fundamentally boring. A friend who made one of Fallout 3’s biggest mods explained to me that it appeared that Obsidian had left a lot of the world’s terrain untouched, which is why so many areas were simply cordoned off with invisible walls or completely flat. For example: one time, I spotted the wreck of an airplane out in a desert. My journey to the wreck took several boring minutes where nothing happened. I just hit the Q key and let my character auto-walk directly to the wreck. There was nothing there. I resumed my original uneventful direction. Ultimately, I went several minutes without having to think about navigating or finding anything worthy of my attention. It was dull. Just walk around Fallout 3’s world and look at how much the terrain varies. It’s always keeping you engaged, always offering something interesting to find. There’s a soda machine here, a bunch of ghouls arguing about water there. A hungry yao guai—that’s a mutated bear, for the uninitiated—may come charging around the corner of an abandoned truck. The environmental storytelling is great, too. One of my favorite places in the entire Capital Wasteland is this bizarre little room with plungers that have been placed at random intervals up a wall. Bloody handprints leading up to the ceiling, an excess of drugs, and a pair of skeletons tell the rest of the tale. Once, I entered an unassuming sewer grate to discover a horrific butcher shop. I was then ambushed by the presumably-cannibalistic raiders who’d set up shop. I fought them off and left that ghastly place. There are several radio transmitters that can be located in the wasteland; turn them on, and you can hear their signals. You can even find out where they’re coming from, and each radio transmitter has its own unique story. A lesser game would probably have made this some sort of quest, marked or unmarked. Fallout 3 simply places them in the world for you to find. If you’re going to make a good 3D game, you have to have good level design. Fallout 3 takes full advantage of its 3D space to create a compelling world. The terrain is never simply flat and boring. There’s always something to see or do, always great attention to detail. New Vegas is the better RPG, but Fallout 3 has the better world. Fallout 3 makes mistakes. The overarching story isn’t very good. The combat isn’t on par with other games Bethesda has published. Its characterizations of previously-established factions, like the Brotherhood of Steel, don’t make a lot of sense. I’ve heard complaints about how the quests were designed. Endless mods attempt to “fix” the graphics. There is a lot Fallout 3 could do better, but that’s true of every game. The fact is, Fallout 3 sold something like a bajillion copies to extensive critical acclaim, and most people look on it as an instant classic, even today. Fallout 3 works because, at the basic, bedrock level, it provides players with plenty of reasons to explore its interesting world. The boredom of Vault 101 soon gives way to a carefully-designed series of missions that take players out into the world, past tons of interesting things, distracting players from the task at hand, but always keeping the moment-to-moment play interesting. As open-world games go, The Witcher 3 may have better quests, New Vegas may execute better overall mechanics, Grand Theft Auto V might have more interesting graphics, but Fallout 3 has one of the best open-world designs in video game history, and that’s what makes it such a great video game. ...wait, no, what am I saying? That’s a great foundation, but there’s more to it than that. It’s one thing to have a great sandbox to play with, but how do you interact with it? Fallout 3 is a big game, after all. I’ve left so much unsaid that it’s big enough to become its own article. Looks like we’ll have to return to Fallout. I’ll see you soon!